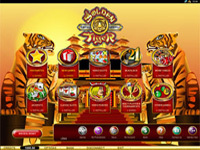 The Golden Tiger Casino is an online casino that uses Microgaming Software, a trusted and known software provider. It is licensed in Kahnawake, one of the most trusted licensing organizations in the gambling industry. The Golden Tiger Casino is the biggest and most successful member of the Casino Rewards Group, and is one of the most highly esteemed online casinos today. The Golden Tiger Casino uses the Microgaming platform, particularly ‘Viper’, which is the software company’s newest release. You can thus expect excellent graphics and superb gameplay. Golden Tiger has about 300 different games to offer, which is quite a lot as compared to other casinos. You’ll surely never run out of games to play in this site. Some of its games include Roulette, Blackjack, Poker, Slots, and Video Poker. What’s great about this site is that it has a number of different variations for each game, so you can be fairly certain that they can accommodate your preferences. However, Golden Tiger may come as a bit of a disappointment for those who love to play slots. Their list of video slot games is not as extensive as, say, their collection of blackjack games. Another of the biggest lures of the Golden Tiger Casino is its very good set of bonuses. Their sign-up-bonus gives you an hour to play away $1500 from the casino itself. This was a particularly sweet deal because it gives us a chance to blow so much money at a short amount of time – a truly rare treat for us average joes. They also have a Reward Buddies system, wherein you get money if you invite some of your friends to play. There’s also a $60,000 cash draw which you can enter just by filling in your details. Furthermore, Golden Tiger Casino automatically enrolls all its members into Casino Rewards, which is by far one of the best VIP loyalty programs in the web. What’s great about this is that you can use the points you gather from other member casinos and spend it on Golden Tiger. The payment schemes that Golden Tiger Casino accepts are credit cards, NETeller, Click2Pay, ECO Card, MoneyBookers, FirePay, UseMyBank, PaySpark, Electronic Check and, of course, Wire Transfer. They accept US Dollars, Euros, GB Pound, and CA Dollars. The Cash Processing in this site is fast and reliable, so you’ll be spared from a lot of headaches.